The sandwich will be available for one day only at a single Arby’s location in Iowa. As part of a one day only promotion, Arby’s is selling the “Big Iowa,” a sandwich inspired by the Iowa State Fair and one Twitter user’s viral pop tarts tweet. A warm sandwich featuring thinly sliced pit-smoked ham, roast turkey, smoked brisket, melted cheddar cheese, red onions, pepper bacon, three mozzarella sticks and parmesan peppercorn ranch on a toasted onion roll, the “Big Iowa” is meant to represent fair food staples. But what makes this sandwich special isn’t just its regional theme. The very idea for it was based on a college student’s viral tweet-turned-meme. In mid-November, Iowa State University sophomore Chris Jorgensen about a sandwich he had cobbled together made up of two simple ingredients: Pop-Tarts and processed cheese. “You ain’t from Iowa if you never had one of these,” he tweeted along with a photo of the unusual creation. Ok. This is weird. just told me that growing up, his mom would put butter on his toasted Pop Tarts. That's weird, right??? It’s not the only time someone has put something unexpected on a Pop-Tart. But following the response to Jorgensen’s tweet, users all over Twitter began posting their own seemingly odd or gross Pop-Tart mashups, even spreading out to other food combinations. While Twitter was busy grossing people out, Arby’s . Extending an invitation to visit its Atlanta headquarters, the roast beef sandwich chain offered to help turn what had become a focus of social media ire into something good. 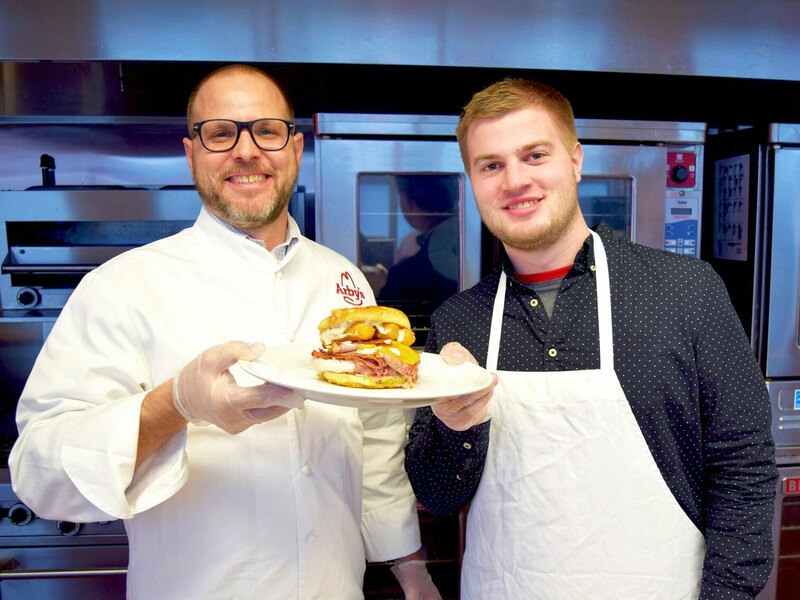 After flying him down to Georgia, Jorgensen and Arby’s Brand Executive Chef Neville Craw worked together to create the “Big Iowa,” a sandwich that Iowans could be more proud of. This time Jorgensen ditched the Pop-Tarts, instead drawing from the Iowa State Fair’s indulgent food spread for suggestions on what ingredients and flavors should be featured in the sandwich. Arby’s is letting Jorgensen and his fellow Iowans try the exclusive “Big Iowa” for a very limited time. Tomorrow, December 14, is the only day you can get the state-inspired sandwich, which can be purchased from the Ames, Iowa Arby’s restaurant located at 409 S. Duff Avenue. It’s conveniently located just a few miles from Iowa State’s campus, so if you stop in, you might run into the man behind the sandwich. Where Does Arby's Get All That Venison?